Ready to take the OPQ32 test? Preparing for the OPQ32 personality test can optimize your job potential. Increase the chances of passing through the hiring process by preparing with JobTestPrep now. The main difference between our personality test and the OPQ32 is in the item format. In each item of the OPQ32, you are presented with three statements and are asked to choose one that is “Most like you” and one that is “Least like you”. In our personality test, there is a section that resembles this, but you are presented with four statements, not three. The other sections in our pack, are in different formats in which you will be presented with individual items to rate on a 7, 5, 3, and 2-point scales; and ranking items where you asked to select one statement “Most like you” and one “Least like you”. The Occupational Personality Questionnaire (OPQ) assessment was designed to give organizations an understanding of how aspects of an individual's behavioral style will affect his or her performance at work. Our OPQ study guide is designed to help you prepare for the OPQ personality test. We provide a detailed description of the OPQ scales vs. our scales as well as a sample item to help you better understand these scales. We also provide information on how the scores are calculated. Our study guides make the OPQ assessment less intimidating by showing you examples and explanations of how to answer questions on the test. Moreover, they help boost your confidence. By practicing for the exam, you will learn about yourself and any specific traits you may possess. This could be the key to getting the position you desire. How Is the SHL OPQ32 Used? The test is comprised of a maximum of 104 questions which measures 32 specific personality characteristics; it is highly complex and is administered on a computer. The candidate is presented with a block of four statements and must choose which of the statements best describes him or her and which of the statements least describes him or her. I really like to help others. I work best in teams. I like to get things exactly right. I sustain high levels of energy. These reports are useful because they are user friendly, go into detail, and show strengths and development areas and provide a clear, concise, graphical summary of performance in job-related areas of expertise. The OPQ32 was developed to ensure that the scales would be relevant and acceptable for the workplace. There are 32 specific personality characteristics, measured by the OPQ32. There are three domains in which the 32 personality characteristics can be found. 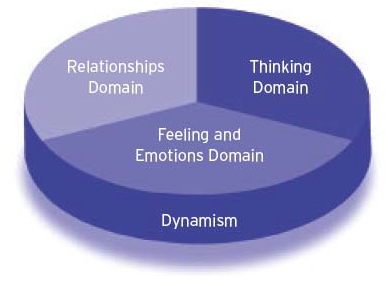 Below are tables of the three domains: Relationship with People, Thinking Style and Feelings, and Emotions.